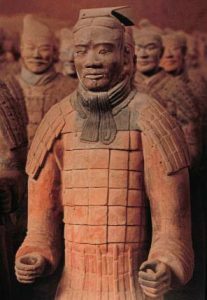 In the Qin Dynasty, about 210 BC, one of the emperors had a whole army of men made out of clay to go in his tomb and guard him in the afterlife. Each one was just a little bit different from all the others: some had shorter hair, while others had longer hair. Some had wide noses, and others had narrow noses. To make a head like the ones the emperor buried in his tomb, build it out of clay. It will use less clay if you make an armature. That’s a core made out of something else. You might use a balloon as your armature, or crumple paper into balls and then cover them with tape. Cite this page: Carr, K.E. 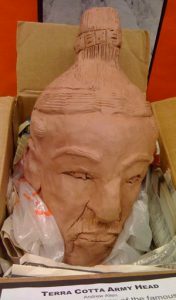 Terracotta Army project – Ancient China. Quatr.us Study Guides, June 9, 2017. Web. April 19, 2019.